Restore colour to a miserably grey city. Here's something I want to see more of: games from old consoles being spruced up and brought to PC, which is exactly what's happening with colourful Wii platformer de Blob. It's a game about, well, a blob, who under your expert stewardship will explore a distinctly monochrome city environment, restoring colour and creativity everywhere he goes. Or, as the game description puts it, "de Blob is a 3D platformer where players maneuver their hero, de Blob. Equal parts amorphous blob of paint, struggling artist, revolutionary and juvenile delinquent, de Blob's goal is to replace the drab, lifeless gray coloring that the I.N.K.T. Corporation has imposed on Chroma City and its inhabitants, the Raydians, with a range of vibrant life-giving colors, all the while avoiding and battling the gray-clad forces of the Inkies". I seem to remember de Blob receiving decent reviews back in the day, even if its multi-platform sequel failed to make as much of a splash. 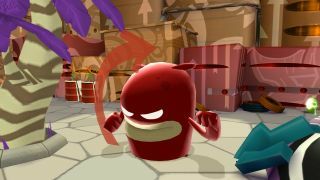 There's no suggestion on the Steam page that de Blob will be enhanced for the PC in any way, although the screenshots do look sharper than the Wii version. There's no release date on there either, but a press release mentions that the game will be hitting PC on April 27.